EA Sports has posted the Madden NFL 18 player ratings for the top defensive tackles in the game this year. Check them out and post your thoughts! I'm liking where they're going with things like the strength rating. It seemed only a few years ago it was nothing to find and DT with mid-90's strength rating. Now I scroll through the free agent list there might be one or two in the low 90's with the rest of their ratings being garbage. Also, I was hoping to see Shariff Floyd get some love, but I don't see anyone I'd knock off the list. They probably have him at DE since the Rams are switching to a 34. I'm guessing because Wade Phillips is going to a 3-4, he's considered and End now... even though in Phillips's 1-gap scheme his responsibilities won't change too much. Suh has the same overall as his number lol. Too bad the football world doesn't redo generalized positions. I'd have liked to have seen a top 10 for this position group at least. All those guys are 4-3 tackles, which is more of a glamour position than the nose in a 3-4 which is all about the dirty work. Williams is a player, but I wouldn't take any of those guys out of the top 5. But his NT still 2 gaps, right? How could a 3-4 work without a 0 NT? Phillips works with a lot of shaded techniques, or 1-gap assignments. You'll see his NT in a 1 or even 2i technique at times. It's kind of a 'hybrid' to the traditional 3-4. Donald will still align as a 3-technique most of the time, working that b-gap. keeps him off any premier T's and C/G combo blocks. Keep in mind that many 3-4 teams consider their DE's as DT's. This is just how Madden groups players. I do agree with the post that Madden should get into the ID, ED, LB grouping. This would help ratings and CFM quite a bit IMO. 3-4 OLBs do not play the same as 4-3 OLB, they play more like 4-3DE. 4-3DEs do not play the same as 3-4DEs. Yet these positions are grouped into the same OVR category for comparison and contracts in CFM. deu22ces gave the really excellent answer here below. 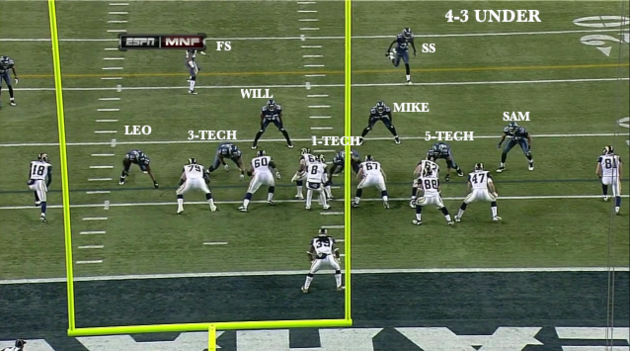 Just to add on, a lot of what Phillips does closely resembles what you'd see in a traditional 4-3. Think of all this stuff as an alignment rather than a defense. When you get to that you'll see how much a lot of this stuff can be interchangeable. Think for example what Pete Carroll does with this base 4-3 Under. For all intents and purposes it plays a lot like what Philllips does with his 1-gap 3-4 right down to the LEO which is a hybrid linebacker/end on the weakside only he has his hand in the dirt. Just a bit of a visual for anyone interested. 4-3 Under - Carroll will even sometimes tilt the Nose tackle and have him 2-gap from time to time. very nice visual. i need to 'learn' how to do that. i'm sure it's like most things and easy once you know what the crap you're doing. You can see how he'll want to use Donald in his 3-4, especially in pass situations. He can't be effectively double teamed b/c the T on the weakside has the edge defender to account for. The other thing with Phillips is he's humble enough to fit his scheme to his players and not force square pegs in round holes. If he took over a team with traditional 3-4 personnel, he'd play more 2-gap traditional. Defensive line ratings in Madden don't mean much if anything...... As someone who plays exclusively with the Dolphins online Ndamukong Suh plays like a nobody and is rarely a threat as he truly is in real life. Rashad Jones rated in the 90s and still is pretty much average in the game and his force is rarely if ever felt int he game.